JAKARTA, Indonesia (CNN) -- Opposition candidates are charging fraud in Indonesia's election, which President Susilo Bambang Yudhoyono won by a more than two-to-one edge over his nearest challenger. Yudhoyono won 60.8 percent of the vote, compared with 26.8 percent for former President Megawati Sukarnoputri and 12.4 percent for Vice President Yusuf Kalla, according to numbers released Friday by Indonesia's National Election Commission. The votes were counted under heavy security after the terrorist attacks on two Jakarta hotels July 17. Police blocked off the road to the electoral commission building and jammed phone signals inside the building. The results will be officially announced Saturday. "We thank God that the electoral commission has successfully finished the vote recap with the results that we expected," said Andi Mallaranggeng, chairman of Yudhoyono's Democrat Party. "Now is the time for national reconciliation. There's time for competition and there's time to unite." Megawati, who led Indonesia from 2001 to 2004, refused to sign off on the final results and vowed to contest them before the elections supervisory board and constitutional court. Kalla also refused to accept the results. He protested irregularities in voter rolls even before the balloting and demanded that counting be stopped. The election commission rejected Kalla's objections. Mallaranggeng acknowledged the opposition's rights to protest but said he did not "believe that anything significant will come out of it that will influence the result of the election." Ahead of the election, analysts and polls had predicted Yudhoyono -- benefiting from the country's strong economy -- would win a second term. Known as "Mr. Clean" because of his anti-corruption efforts, Yudhoyono also gained popularity for his handling of the 2004 tsunami recovery and the country's battle against terrorism. 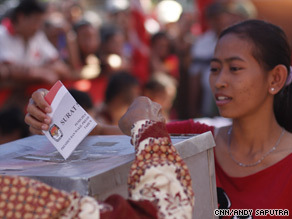 The retired general is the first president re-elected in a direct vote by Indonesians. Indonesia's march toward a stronger democracy is closely watched by the United States. The latest Pew Research Center poll on global attitudes, released Thursday, found that the world's largest Muslim-majority nation is an exception to otherwise unfavorable ratings of America in the Islamic world. An overwhelmingly negative view of the United States during George W. Bush's years in the White House have turned around with the election of President Barack Obama, who has family ties to the southeast Asian nation. This year, 63 percent of Indonesians said they had a favorable opinion of the United States.